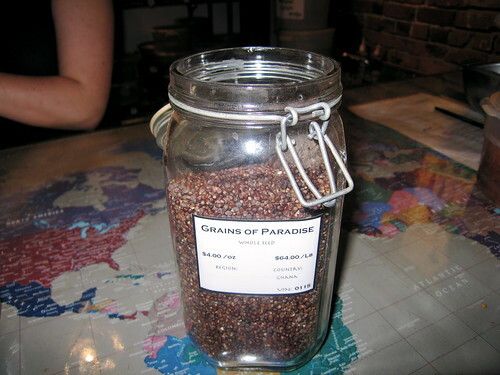 I first learnt of Grains of Paradise on Good Eats, my favorite show on the Food Network. It was an episode on lentils; Alton Brown was making lentil soup with Grains of Paradise. He extolled its virtues and how much he loved it. This piqued my curiosity, but it wasn’t until last weekend when we went to the ChefShop.com store on Elliott and saw that they had a bag. Of course we bought it. Grains of Paradise is native to Western and Northern Africa and is often found in local recipes. It’s similar to a mix of pepper and cardamom, but has its own distinctiveness. Pungent, floral, and spicy, we’ve started using it in lieu of pepper. Put it over eggs, into soup, on salad, and we’re only getting started. It has definitely been a fun spice to use and we’ve even started using our own grinder specifically for these red little flavor bombs. If you’ve been thinking about adding something different to your food and step outside yourself, give grains of paradise a shot. It’s being talked about online as a flavor to try. You can grab it from ChefShop.com and World Spice also carries it. And after getting it try adding it any and everything. Photo from The Amateur Gourmet. holy crap. when i added you to my blogroll, i noted it as “good eats of seattle”… without knowing your love for alton brown. i LOVE alton brown! he and i used to shop at the same farmer’s market. 🙂 he lives not too far from me… cool huh?! grains of paradise (Aka guinea pepper…).